Here’s a sneak peek at the second illustration for the Ferret Files, courtesy of my good pal Richard Argent over at www.argentart.co.uk. Many years ago when I was but a lad and there were only three channels on TV, Friday night changed forever. 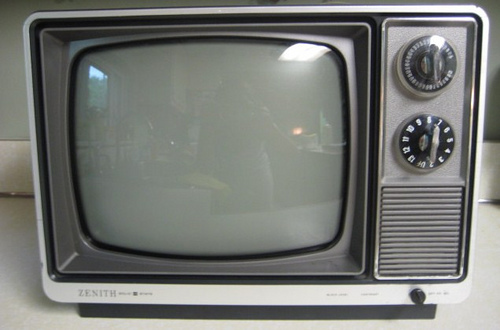 My dad, being a pioneer of all things media related purchased a color television, with the result that the old black and white set found its way into the bedroom I shared with my brother. It turned out to be one of those just in time moments. I’d been constructing and painting model kits for a few years, and had moved onto a range by Aurora, which were based on the monster movies of the day. Dracula and the Mummy had turned up in my stocking the previous Christmas; my brother got Frankenstein and the Wolf Man. 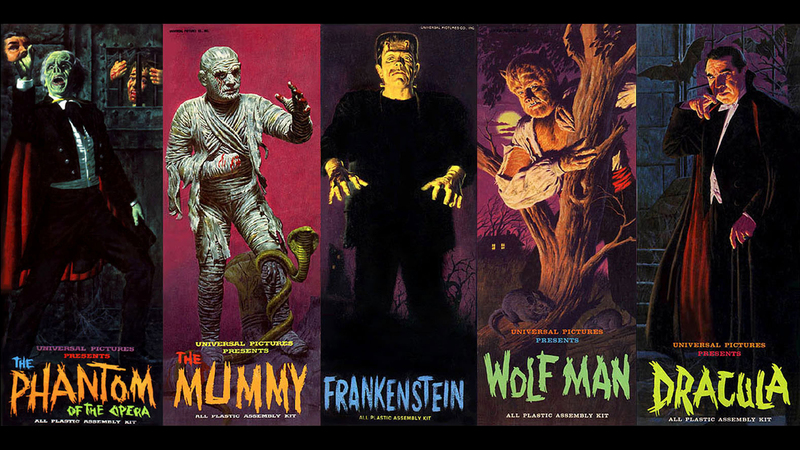 Having never seen the movies, we made up all sorts of stories about our monsters, imaging what they got up to. Vampires in particular scared me senseless, I was petrified of them. I used to watch a lot of Doctor Who, he was my go-to hero of the day. I tried to imagine how the Doctor might deal with Count Dracula, concluding that even a sonic screwdriver was no match for the might of the pointy teeth! It was much to my surprise/shock/horror then, when one of the three channels announced they were going to start a season of Hammer Horror films on a Friday night, beginning with the classic Dracula. My brother couldn’t wait. For me, it was a terrifying countdown to a showdown with my horror nemesis, the Prince of the neck-suckers himself. The tension became unbearable. Even my parents knew that something was up, because if there was one thing they found absolutely impossible it was getting two young lads to go to bed on a Friday night, so they could get up to a bit of ‘parent stuff’. That Friday night we were well behaved and ready for bed early. It was unheard of. In preparation, I borrowed a cross from my gran – I’d learned from a school mate that vampires don’t like Jesus. My brother being more of a pragmatist borrowed a wooden tent peg from the family tent set. He too had heard stories about vampires, and was determined to deal with Drac in his own way, should the pesky blighter try anything window related while the film was on. From the opening score onwards I was under the sheets, hiding behind a pillow. 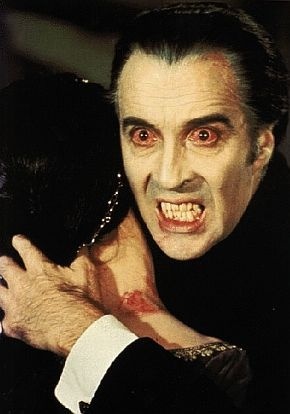 Within fifteen minutes it had all gone horribly wrong for Jonathan Harker, who been warned to flee, then attacked and imprisoned by the most evil vampire of them all, portrayed horrifically by the magnificent Christopher Lee. Enter our saviour in the form of Van Helsing, played by Peter Cushing. Peter had played Doctor Who in a couple of made for TV movies, and this wasn’t lost on me. Not quite the right Doctor, but the Doctor nonetheless had come to the rescue and with the aid of a curtain and the rising sun, eventually defeated the evil one. Over the next few weeks, we watched ‘Brides of Dracula’, ‘Dracula Price of Darkness’, ‘Dracula has Risen from the Grave’, to name but a few. The double act of Lee and Cushing to me as a kid was as perfect as Sooty & Sweep, Spocj & Kirk or Bill and Ben. The perfect horror duo played tag-team with our hopes and fears, frightening the jim-jams offa me, whilst also instilling a love of the horror genre that persists to this day. It’s with great sadness that I heard of the passing of the Prince of the neck-suckers. Part of me wants to believe that given enough virgin’s blood, he’ll be back. That’s certainly the way it ought to be. For now though, I’m going to make a point of rewatching ‘Dracula’ this Friday night, and reliving old memories. 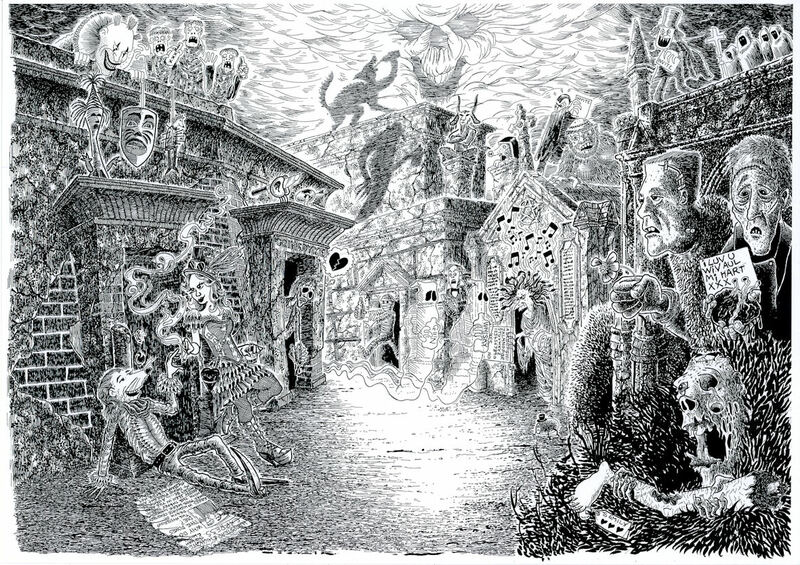 On a Ferret related footnote, I’ve been working with my pal Richard Argent on the first illustration for the novel, which is set in Highgate Cemetery West, a location used often by the Hammer Horror film crew. The whole Hammer Horror genre has been in my thoughts a lot lately, as we’ve complied a list of all the monsters we want to fit in the illustration. Hence my reasons for penning a tribute to a guy I didn’t get to meet, who was nevertheless influential in converting me to Hammer Horror and a film catalogue we all know and love. One of my great guiding lights.